The Red Paddle Co Sport is available in either 11’0 ,11’3 or 12’6 lengths. The 11’3” offers fast inflation and great flat-water performance for riders up to 90kg, while the 12’6” is more suited to longer touring trips and/or the larger rider. The 11’3 is only slighly longer than the 11’0 but has an extra 2″ of width making it more stable. 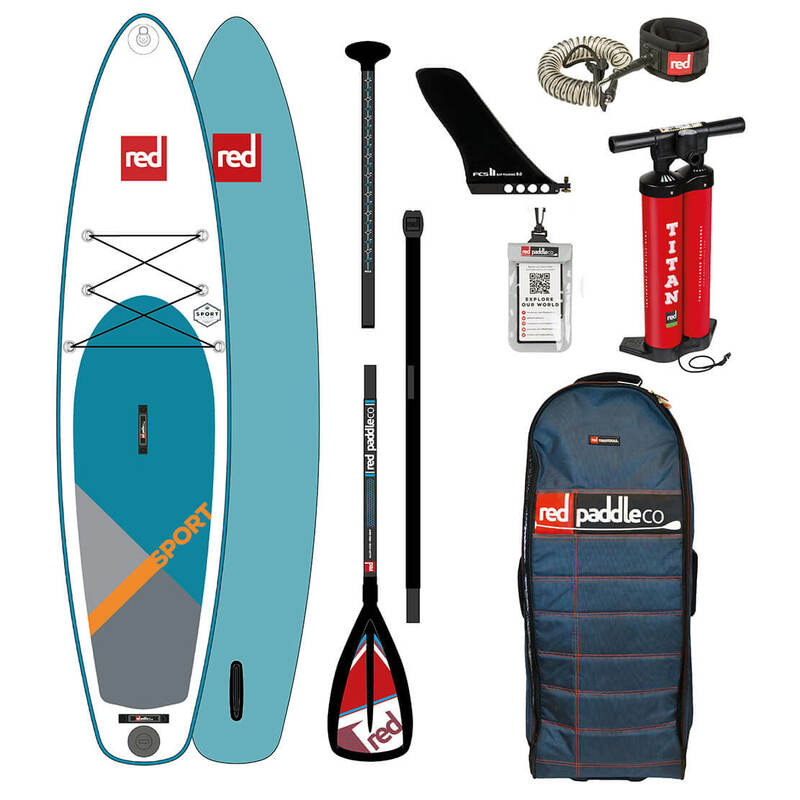 The Red Paddle Co Sport SUPs are fitted with Red Paddle Co’s patented RSS system for maximum rigidity. MSL fusion composite and airtight coating – Introduced to the Red Paddle Co Sport in 2016, MSL involves fusing a second layer of hard-wearing polymer to the dropstitch core at the raw material stage, removing hand gluing errors. The high-tech industrial process also saves almost 2kg in weight and makes the boards stiffer at lower pressures. Titan Pump – The world’s best SUP pump has been totally redesigned making Titan pump even more efficient – less pumping, more paddling. This double-barrelled pump is lightweight and fits in the Red Paddle Co board bag, but has the capacity to inflate your SUP in under 5 minutes; twice as faster as many rival pumps. Mount – Every Red Paddle Co SUP board comes with a special fixing that is compatible with world-leading Ram Mounts products, plus Railblaza, enabling you to securely attach a range of accessories, from GPS devices and cameras to fishing rods. Bag – The celebrated Red Paddle Co backpack has wheels for easy transportation and a foil liner to protect the board from extreme temperatures. For 2018 the straps have been made even more comfortable and easy to stow. "We had a fantastic lesson with Adrian today. Ullswater is such a beautiful place to learn to paddleboard; the scenery is awesome! The wave off the 'Steamers' provided some great entertainment too. Can't wait to come back - cheers!"